I have a confession to make. It seems a sacrilege. Please don’t hate me. He approaches things in a way that can rub me raw. And yet, I have to admit, this can bring out a new understanding, polishing a truth. Such is the case with Othello, playing at Portland Center Stage through May 11. The play offers a visceral journey through jealousy, a perspective both fresh and centuries old. There are stunning performances. And for me, there’s a burning itch to set the bard straight. No, Shakespeare buddy. Life isn’t like this. Here’s the deal. 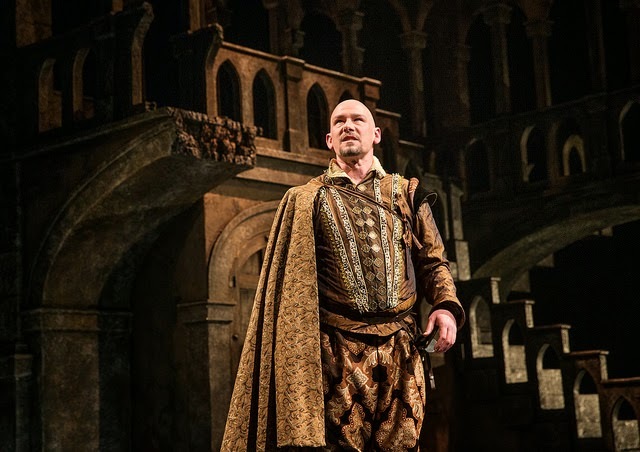 Iago, the brilliant sociopath, masterfully crafts circumstances and conversations that will bring down the man he hates, his boss, his general, the virtuous Othello. Iago will twist Othello’s guts in suspicion, make him a slave of rage and bring him to his knees in despair and utter ruin. He’ll use that new wife, Desdemona (Nikki Coble). He’ll brew up some hot, sticky jealousy and throw in the young captain who got the promotion, Cassio (Timothy Sekk - one of my favorites in this show). So it begins. Our PCS Iago (Gavin Hoffman) has a wonderful physicality to him, sneaky and smug, lurking and strutting. We love hating him. What bothers me is that no one human being can or should have so much power. That another person holds the keys to your trust, jealousy, fear, and love is unthinkable. That another human, with such wily watchfulness, knows everyone’s weakness and manipulates it perfectly to his own advantage – I don’t want to believe this is possible. It’s not the evil that I doubt. It’s the abdication of the hero. Yes, people can and do blame others for their actions and feelings. But can an outsider, even a brilliant Iago, steal away a pure and unwavering faith? If you really love and believe in someone or something, tricks and nuances and games, no matter how subtle, won’t change that inner knowing, that intuition, that conviction about what’s real. Making another person accountable for your descent into evil perpetuates the idea that we aren’t responsible for our thoughts, emotions, and actions. Iago has everything but the forked tail. Sure, he plants the clue of the handkerchief. He orchestrates the eavesdropping sessions. But he can’t change the heart. When we see the human psyche as simply a computer to be reprogrammed by a whip-smart sociopath - well, in my book, we discount the power of the human spirit. That said, the PCS performance made me think twice about all this. 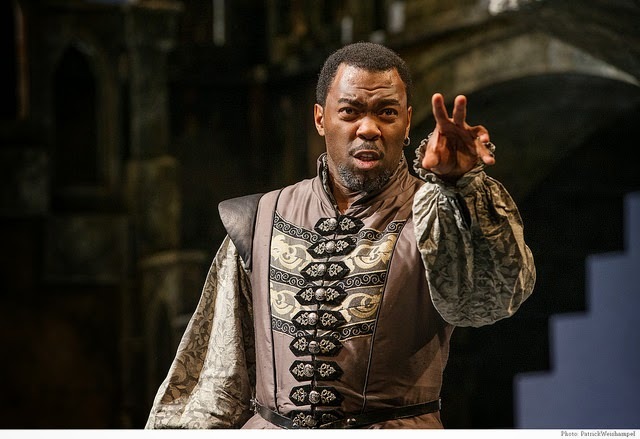 Daver Morrison’s Othello undergoes a transformation that seems so lifelike. Iago works at him one thought at a time, and it’s moving to see Othello grappling. My friend commented that Morrison brought a sweet tenderness and humanity to the role. We feel the tears as he begins to swallow the lies about the woman he loves. Othello touches his throat. “It stops me here . . .” Heartbreaking. As I was thinking about the play - and Shakespeare was unavailable for comment - I had an “aha” moment. Maybe Iago isn’t that other person. Maybe Iago represents the part of ourselves willing to be deceived, clinging to worries and obsessions. In love, we are our most vulnerable. Deep inside, we ask ourselves, Do I deserve to be happy? Do I deserve to be loved? The wily villain may be that first jealous thought, that quavering shadow that falls over our happiness. The evil being is someone we hire as our right-hand man. We entertain the thoughts and keep them with us day after day. This is how destruction comes about. No horns or tail required. Ha, I like that! Yes, in some ways Iago is just a personification of jealousy. Maybe Shakespeare teased the characters of Iago and Othello apart, so that Iago carries all the blameworthy ugliness and Othello all the innocent grief: in reality, they're usually all twined up in each other. Dale, thanks - I like that thought very much! It's almost a Jungian way of looking Shakespeare. Intrigued about what we might find next. .